Ecodenta Whitening Black Toothpaste with black charcoal and Teavigo is designed for people looking for innovative & unconventional daily solutions. This toothpaste effectively removes plaque and has a strong whitening and uniquely refreshing effect. The innovative substance known as TeavigoTM ensures full dental care: it protects against tartar, provides a gentle antibacterial effect, and leaves you with a long-lasting feeling of cleanliness and freshness. 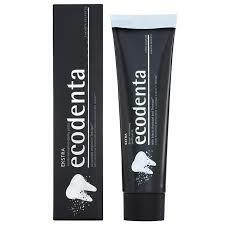 Presenting a more refreshing toothpaste with more whitening which is as black as coal.